Gee, what a magical transformation. Going by those pictures I don’t think he had any work done or is wearing a toupee. 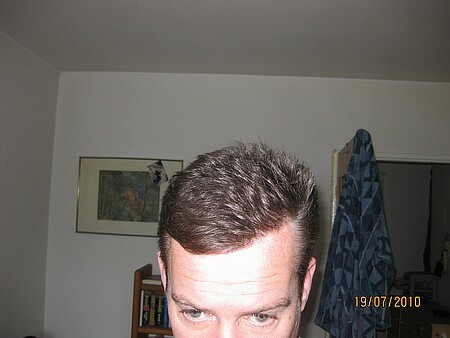 In the before picture he has gell or something in his hair and it’s combed back. In the after picture it’s dry and parted on the left. When you part your hair on the left or right and comb it over you are doubling the density because you have hair going over hair. 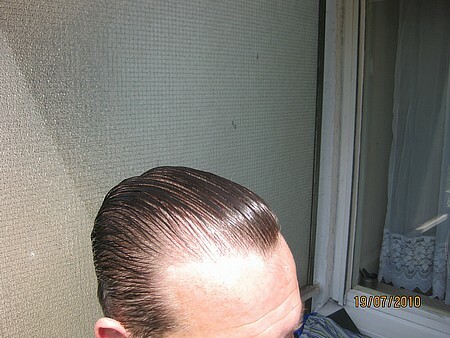 When you comb it straight back you lose this affect. Just my two cents. The left temple/zone 1 has basically 3 hairs hanging on!!! 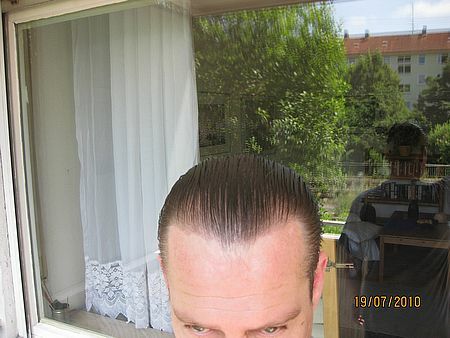 Gel no gel there isnt any hair! There are hardly any hairs!!! if ever he losses those hairs again, he should turn to God. Hello Evan Almighty. No, I’m not kidding you man. This person isn’t a celebrity but it gives you an idea of how combing wet hair back vs combing dry hair left to right makes a huge difference. The pictures are date stamped so you can tell they were all three taken on the same day.